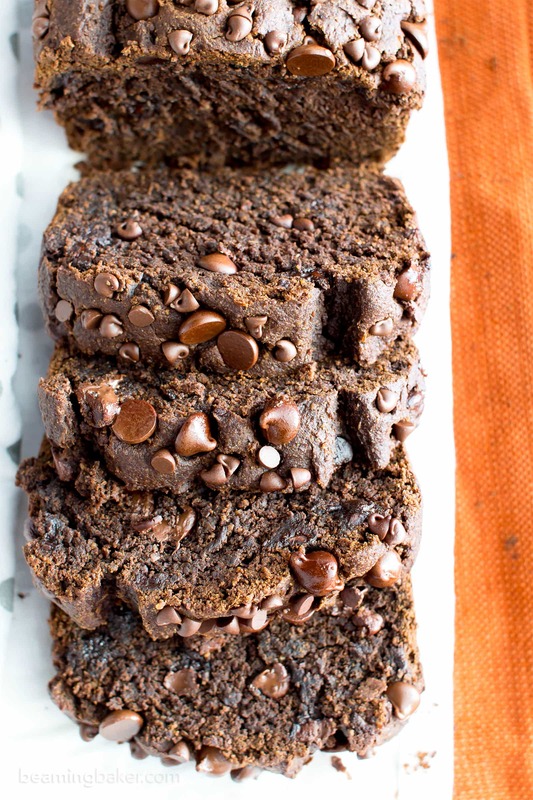 Gluten Free Vegan Chocolate Pumpkin Bread (V, GF): a one bowl recipe for perfectly moist ‘n decadent chocolate pumpkin bread made with warm spices and your favorite fall flavors. Gluten Free, Vegan, Dairy-Free, Refined Sugar-Free. Happy Fall!! Okay, happy almost fall! Yes, I went ahead and looked up the actual first day of fall in case any of you season aficionados are fact-checking. Alright, be honest, are there any season aficionados out there? Anyone?? How about almanac maniacs? Ooooh, I just had to say that. Forgive me? Well, the first day of fall is Friday, September 22, according to my super trusty, well-educated friend named Google. Yeah, we go waaaaay back. 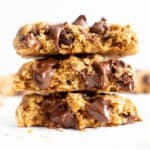 Now before I go on a huge tangent none of us will recover from (like telling you about the life-changing gluten free no bake brownie energy bites I’ve been eating all week), let me also say, Happy Almost Weekend! <– Totally the best part of Thursday posts, don’t you agree? And to celebrate these two kinda-holidays-in-one, I’m super pumped to share my Gluten Free Vegan Chocolate Pumpkin Bread with you. After all, chocolate is one of THE best ways to ring in seasonal changes/the weekend/making it through the workday/it being 2pm… those kinds of momentous things. 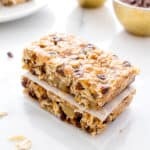 Just look at these homemade dark chocolate sea salt KIND nut bars, and you’ll instantly know what I’m talking about. Even though I’m still sorta reeling from how fast this season has come upon us (yes, I’m that person at the grocery store who’s gawking at the Halloween candy display in July…. JULY!!!!! ), I’m ALL IN when it comes to pumpkin. So I’m not gonna tell you that I frantically spent all of last week, day and night, working on this recipe. Or, that I seriously considered growing an actual pumpkin patch in my non-existent backyard because I live in the city. Or, that pumpkin and I had a bit of a staring contest to see who would come out victorious (obvs pumpkin won). Or, that everything I see and smell is now in Pumpkin Vision because it’s gotten real up in my kitchen. Luckily, Erik and I enjoyed our hilarious (read: highly unpleasant and comically confidence lowering) pumpkin trials last year. If you want to feel so much better about yourself, read the pumpkin bread recipe post. 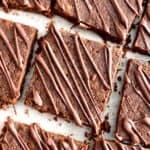 So this year, I was able to make that reader-favorite recipe and give it the ol’ splendid chocolate makeover!! Yeah! 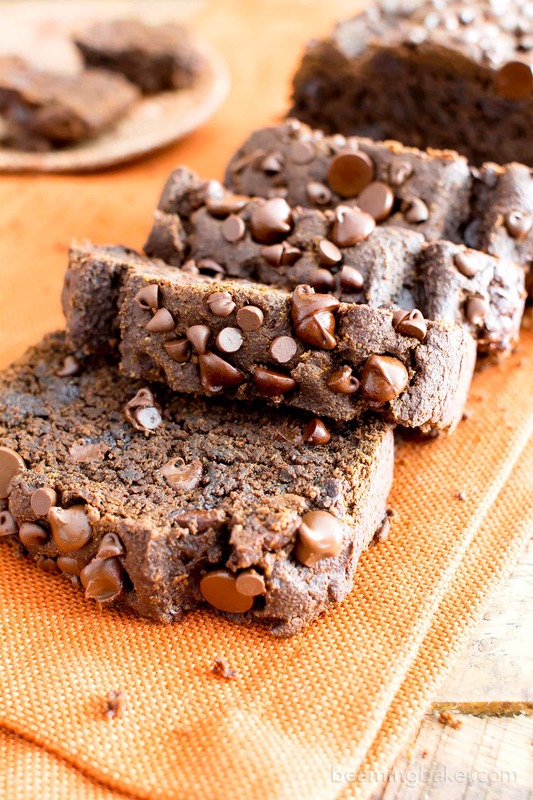 If you LOVE chocolate and pumpkin, then this recipe is all for you. If you don’t like either of those things, then why are you here? J/k! Hugs!!! I’ll just spray some perfume or something to cover up my now ever-present pumpkin aura. 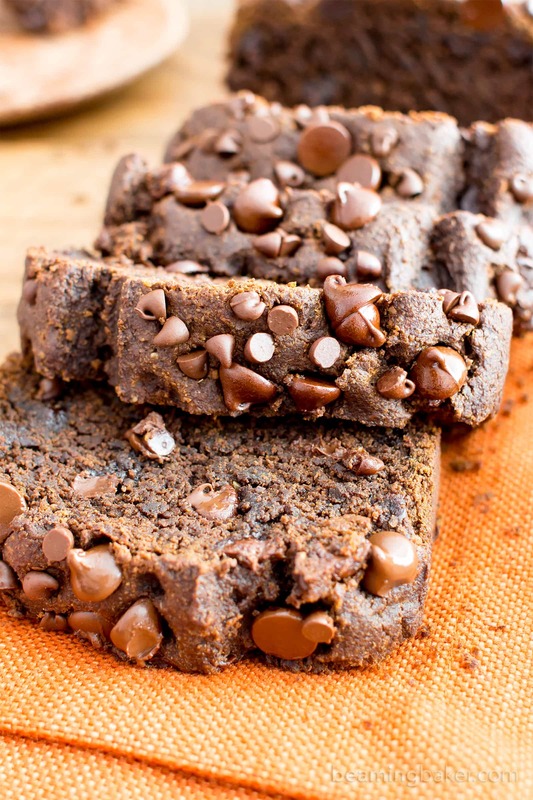 Gluten Free Vegan Chocolate Pumpkin Bread (V, GF): a one bowl recipe for perfectly moist ‘n decadent chocolate pumpkin bread made with warm spices and your favorite fall flavors. Gluten-Free, Vegan, Dairy-Free, Refined Sugar-Free. Preheat the oven to 350°F. Line an 8-inch or 9-inch loaf pan with parchment paper or greased foil. Set aside. 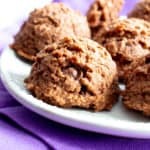 Add the dry ingredients: oat flour, cocoa powder, almond meal, baking soda, baking powder, cinnamon, cloves, nutmeg and salt. Whisk together until difficult to stir. Using a rubber spatula, fold until just incorporated, making sure no flour patches remain. Fold in Add-in chocolate chips. Pour batter evenly into prepared loaf pan. Using a butter knife, cut a slit down the center (or off center, based on your preference). Use the knife to go back over the line, widening the slit. 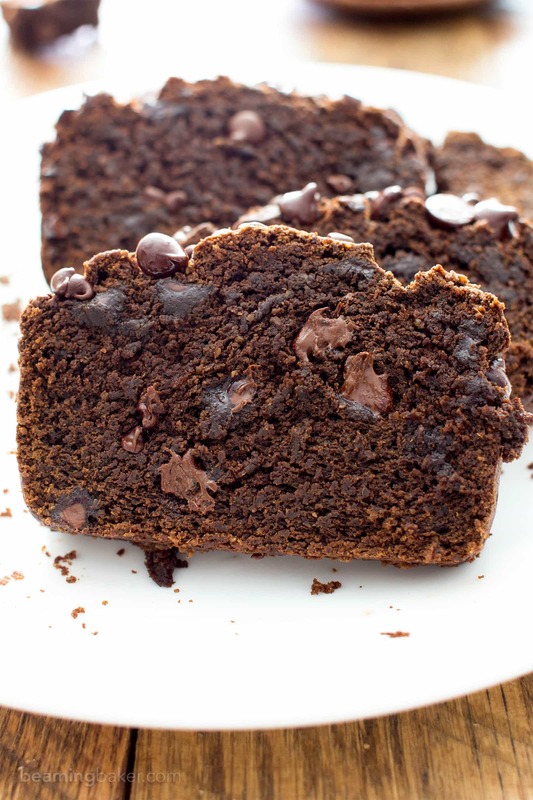 Sprinkle chocolate chips on top of the loaf. Lightly press chips down to secure. Bake for 55-70 minutes. * (In my 8-inch loaf pan, mine took 62 minutes). Test for doneness by sticking a toothpick into the center of the loaf. The toothpick will come out clean when the loaf is done. Allow to cool on a cooling rack for 2-3 hours, or until completely cool. Lift the loaf out and place on a clean workspace. Slice and enjoy! Storing instructions below. - Adapted from my One Bowl Gluten Free Vegan Pumpkin Bread and my Chocolate Banana Bread (Vegan, Gluten Free, Dairy Free). - *In an 8.5” x 4.5” loaf pan, mine took 62 minutes. In an 9”x5” loaf pan, mine took 57 minutes. -**You may substitute all three spices for 2 teaspoons pumpkin spice. - Storage notes: Store in an airtight container for up to 1 week at room temperature. - Freezing instructions: Store in an airtight container in the freezer for up to 1 month. Allow to thaw at room temperature for 30 minutes, or pop in the microwave for 30 seconds or more. - Nutrition Info: is an estimate based on 12 total slices without optional topping. - More pumpkin recipes: chocolate chip pumpkin muffins, one bowl pumpkin chocolate chip bread, pumpkin pie smoothie. I’m loving everything pumpkin right now! And its perfect because its one bowl! One of my kids has a nut allergy. Have you tried substituting the almond meal with any other flour? I’m glad I’m not the only one that falls behind on autumn baking LOL I feel like everyone was bringing out pumpkin recipes before I was even thinking about it! Can I just use pumpkin pie spice instead of the cinnamon, nutmeg, Clove separately ? If so how much should I use ? Can’t believe this bread has all those healthy ingredients and remain a great texture! The flax egg sounds so interesting. I’ve never heard of it but I can’t wait to try it out soon! 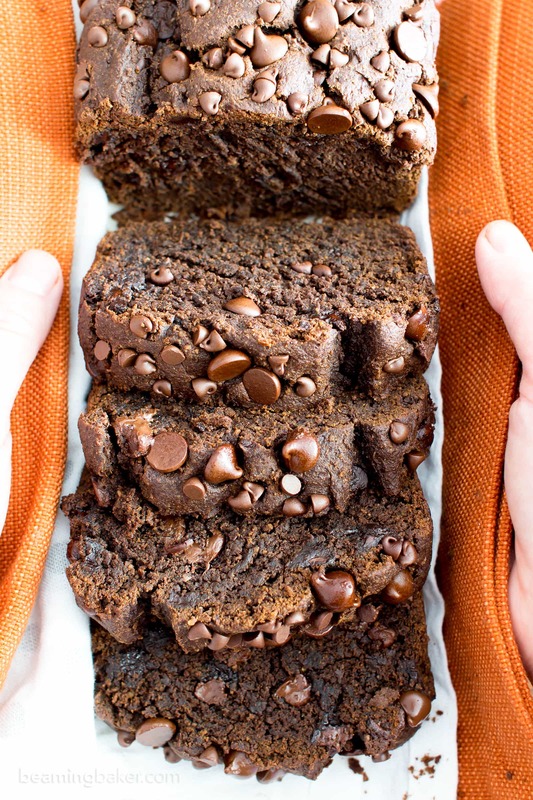 This pumpkin chocolate bread sounds and looks amazing! I love pumpkin and chocolate by itself already, but together is just like a dream food! 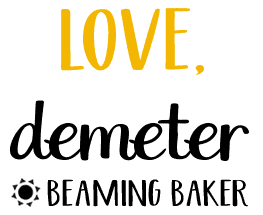 Love this Demeter! 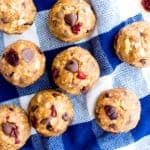 I can’t have oat flour, can I substitute it with something else, can I use gluten free flour? Is there a nut free substitute for the almond meal? grinding up oatmeal woud be an alternative to oat flour, wouldn’t it? Hi Julie, yep! 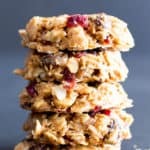 You can make your own oat flour by grinding up old-fashioned (sometimes referred to as “rolled”) oats. Grind until you get a fine flour. Enjoy! Hi Christine, a chia egg will work just fine! 🙂 Can’t wait to hear what you think! Hi. 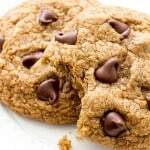 Can regular all purpose flour be used instead of the oat flour? I also have coconut flour. Trying to not have too many different types of flour on hand. 🙂 Thank you! I made this recipe today. It was amazing!!!!!! Very easy to follow the recipe and it was so moist and so fudgelike. Yum!!!! I made this recipe last night and am so happy with the results! I recently found out I am allergic/ intolerant to many things including eggs, dairy and gluten. I am so thankful for your abundance of recipes to try!!! 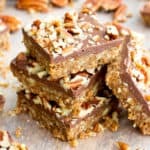 What is the nutritional breakdown for this recipe? Hi Jill! I just calculated the nutrition info for you. 🙂 It’s located below the Notes portion of the recipe. Enjoy! Overall, I think the recipe was great. Just a bit too sweet for me! 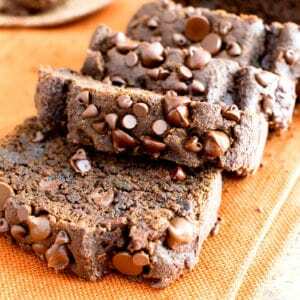 I made two double batches–turning one into mint chocolate chip brownie ‘form’! However, since I’m very sensitive to any kind of processed sugars (including maple syrup)–getting candida from them, I used date & raisin puree for all the sugars, adding water to keep the same amount of fluid/wet ingredients equal to the recipe. I also substituted unsweetened applesauce for the oil. It was much less sweet, which I loved, but tasted great! To complete the “brownies”, I used tiny dark chocolate chips, chopped walnuts, and peppermint extract instead of the spices. Lastly, I think this recipe is very versatile! 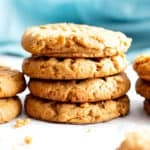 One can substitute a few ingredients to change the flavors–turning it into cookies, brownies, a cake, or loaf. Thank you for sharing it! So happy you found a way to adjust the recipe to your tastes and needs! 🙂 The brownies sound simply amazing (peppermint extract has been ALL over my blog this season). ;) Thank you for stopping by and sharing the fun details of your kitchen adventures with my recipe! Hi! 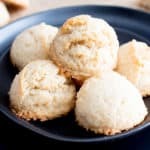 I’m going to use Bobs all purpose GF flour but instead of almond flour or sunflower seed flour can I use more gf flour or something else? Can I just leave out the almond flour altogether? Hi! Yes, use more gf flour—add about 1/4 cup + 2 tablespoons more, since its drier than almond flour. Enjoy! !